RIDE THE BAM TRAIN. 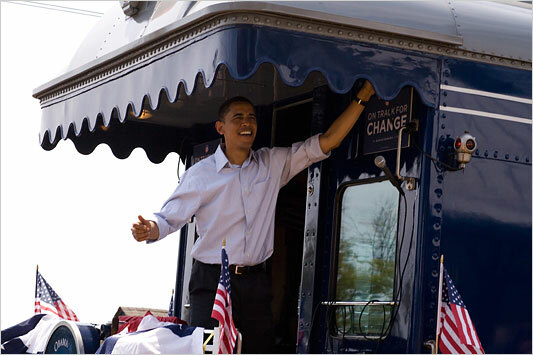 Democratic presidential nominee-to-be Barack Obama pulls the train whistle as his campaign leaves Wynnewood, Pennsylvania. WASHINGTON – Barack Obama began April with a 5-to-1 cash advantage over a debt-saddled Hillary Rodham Clinton, setting the stage for his lopsided spending in the crucial primary state of Pennsylvania. Financial reports the Democratic presidential candidates filed with the Federal Election Commission on Sunday show Clinton had $10.3 million in debt at the start of the month and only about $9 million cash on hand for the primaries. Obama reported having $42 million for the primary. Clinton’s red ink poses yet another obstacle to her campaign as she seeks to end the primary season with a string of victories. She trails Obama in delegates, states won and popular votes. And she can’t dent Obama’s superior fundraising. The March money positioned Obama to undertake an expensive April campaign in Pennsylvania, where he has spent at least twice as much as Clinton and cut into her lead. Pennsylvania votes Tuesday. Clinton, who had kept pace financially with Obama throughout last year, had even less cash on hand than Republican John McCain. McCain raised $15.2 million in March and had $11.6 million in the bank at the start of April. It was his best fundraising performance of the campaign, coming after he had essentially secured his party’s presidential nomination. With the Democratic contest still in full boil, McCain has been on the sidelines, saving his money and completing loan payments. Nearly half of Clinton’s debt in March is money owed to the firm of her demoted former chief strategist, Mark Penn. The report shows that the campaign owes $4.6 million to Penn, Schoen & Berland Associates. The campaign already has paid the firm $14 million, including $3 million in March for polling and direct mail. Clinton took away Penn’s role as chief adviser earlier this month after he met with Colombian officials to discuss his private work on behalf of a Colombian free trade agreement, a trade deal Clinton opposes. The March reports marked the end of the first quarter of 2008 and illustrated how fundraising has spiked dramatically compared to the four quarters of 2007. Obama has raised $132 million so far this year, surpassing his total for all of 2007. Clinton raised $68.5 in the first quarter of this year; her average quarterly fundraising in 2007 was $27 million. McCain has raised $38 million this year, also exceeding his 2007 total. Obama’s fundraising in March led all candidates, but was still lower than the mark he set in February, when he raised more than $55 million. The Illinois senator has raised $235 million in his campaign. Money alone hasn’t guaranteed Obama victories. He spent $30.6 million in March to Clinton’s $22 million. The month began with tough contests in Ohio and Texas. He lost the popular vote to Clinton in both state primaries even though he outspent her, but he emerged with more delegates in Texas. His report showed he spent $9 million on media advertising in March; Clinton spent less than a third of that. Obama spent nearly $5 million on telemarketing and $3.6 million for travel and lodging. Clinton spent about $5 million on travel and about $2 million on phone banks. Clinton spokesman Jay Carson said her online fundraising is rising and noted that the March figures do not include the $2.5 million she raised last week at an Elton John concert in New York. Carson said the event’s total included money from 6,000 new donors. In January, Clinton made a $5 million personal loan to the campaign. The campaign has reported no other personal loans since. McCain’s biggest expense of the month was $3 million to Fidelity & Trust Bank to finish paying off a $4 million loan that had become the focus of a stalemate between McCain and the FEC. Campaign finance regulators want to make sure McCain did not use the promise of public financing in the primary to secure the loan. McCain was eligible for public financing in the primary, but his lawyers said they did not use that eligibility as collateral. He also refunded donors about $3 million in contributions, most of it money he had received for the general election. The refunds set the stage for McCain to accept about $84 million in public funds for the fall campaign. Candidates who accept public financing cannot raise money from donors for the general election campaign. In March, his operating expenses were $5 million, his smallest monthly expense so far this year. McCain’s expenses ranged from $758,000 for air charters to $151.55 to a Los Angeles florist. The campaign reported a debt of $707,000, much of it outstanding American Express billings. McCain had his most fundraising success in California and Florida, each of which yielded more than $1 million.